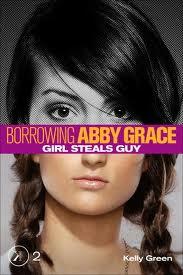 Fans of Borrowing Abby Grace are in luck... As of December 2011 Amazon has both of the first episodes in the series on sale for just $0.99. Don't miss your chance to get these books at a bargain price. We first met Abby Grace when she woke up in the back of a van during a kidnapping attempt and discovered she was a shadow--a soul sent into other bodies to solve a crisis. In this second episode, Abby thinks her mission is pretty cut and dry. Her best friend is inconsolable over her breakup with the star quarterback, so clearly she needs to reunite them. It turns out to not be quite as clear-cut as she thought. Abby's (host's) best friend has a pretty big secret and the fact that she's *not* pining for the quarterback is only a small part of it. Abby also helps her host body with an overly aggressive boyfriend. Girl Steals Guy is just as enjoyable as The Shadow, although the romance aspects might turn off some boy readers. The more we read of Abby--the real Abby underneath her host body--the more we like her and hope that she is able to find her way back to her true self. Kelly Green's writing is sharp and witty. There's just enough information to help Abby (and the reader) solve the mystery without a bunch of boring backstory. The stories truly are episodes--quick reads that we hungrily devour and eagerly look for the next one.